The grandstand at the Eastern Reserve, Winchelsea was erected in 1923 as a functional memorial to the people of Winchelsea and district who served in the armed services in the First World War. 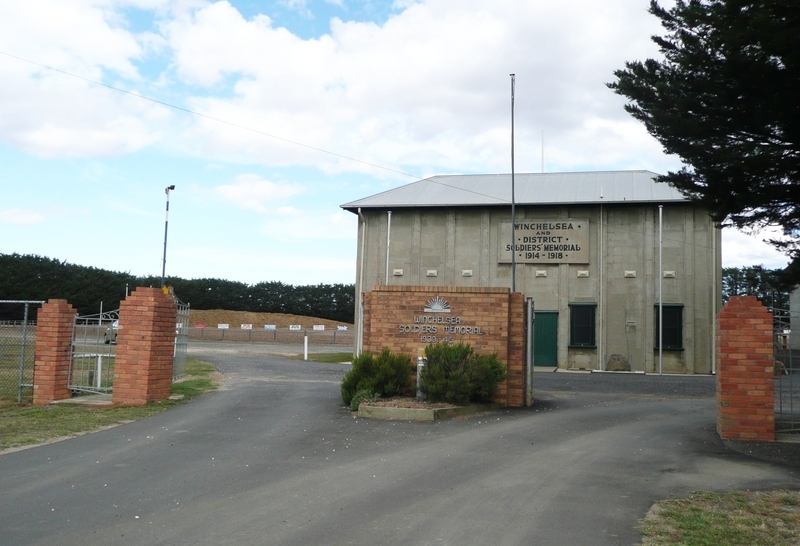 The brick and metal gates were built in 1952 to commemorate the service of the men and women of Winchelsea in World War Two, and to provide the main entrance to Eastern Reserve. Together the grandstand and gates form the Winchelsea war memorial precinct at the most prominent sports reserve in town. 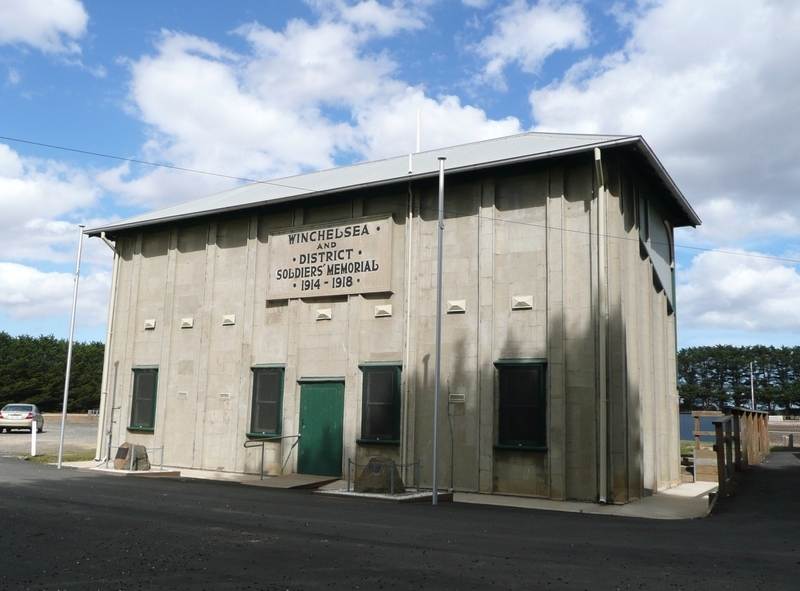 Despite the small population of Winchelsea, funds for a World War One memorial were raised by public donation, resulting in the erection of a substantial grandstand, incorporating the Winchelsea and District Branch of the Returned & Services League (RSL) clubrooms under the seating. It was built by voluntary labour at a cost of £775. A local business group was involved in its construction, using the Knitlock system, patented in Australia by Walter Burley Griffin in 1917 and described by him in Australian Home Builder in 1922. This system was developed as an economical and quick do-it-yourself construction system, with machine produced standard concrete tiles, or segments, which were fitted together on site. It appears that three local men were involved in the development of the Knitlock system of construction in Winchelsea; Mr Anderson (finance), H. E. Warner (builder) and A. McDonald, who established a Knitlock manufacturing works in a shed in Hesse Street, Winchelsea. Machines and timber moulds were used to cast the concrete tiles, which were basically of two types; the vertebral, quadrant shaped block, that formed the framework and the distinctive vertical piers, and the tesseral block that provided the wall infill. The former blocks formed columns and corners and the latter were interlocked back to back with staggered joints, resulting in smooth surfaces both externally and internally, and the facility to incorporate steel reinforcing rods in the core between blocks. Blocks were one foot square and vertical piers, with hollow cores, placed at four foot intervals. Timber moulds that were used in their manufacture have been retained, and are exhibited in the collection of RSL memorabilia at the building. A number of tiles have also been retrieved and are in the possession of the Winchelsea Historical Society. Walter Burley Griffin first used his patented system in 1919 and designed a number of houses using this construction technique both in Victoria and New South Wales. Other architects, such as Klingender and Alsop, also utilised this mode of construction and designed 'Jura' using Knitlock construction in Lorne in 1919. H. E. Warner was one of the few builders in the district and some of his work was in Lorne, however it has not been established whether he was the builder of this Knitlock house. The only other recorded use of Knitlock in Winchelsea is a house that is extant, however not accessible to the public, and a fence, which has been demolished. 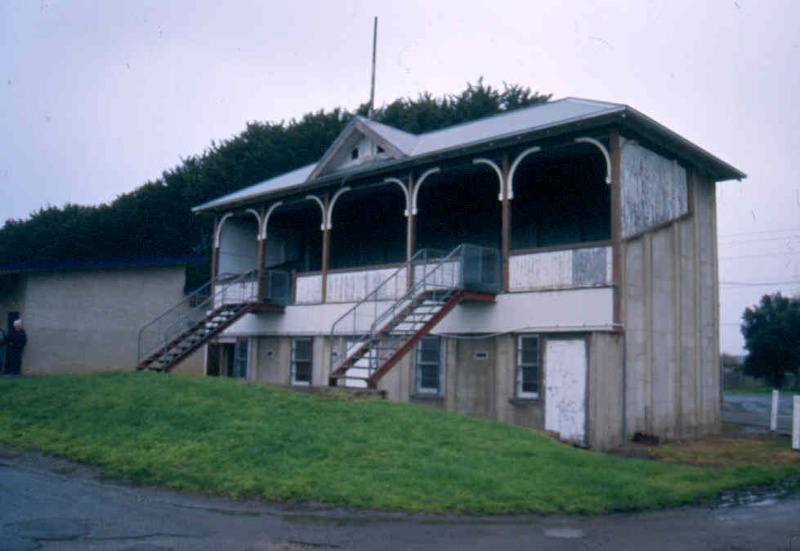 The grandstand building is a two storey rectangular structure with hipped roof supported on timber trusses. 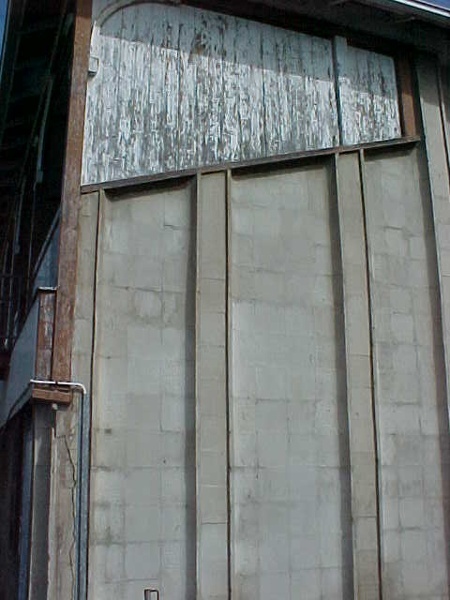 The approach side of the building contains a centrally placed plaque at the upper level and four regularly spaced windows between piers at the lower level. The symmetrical oval facade incorporates a centrally placed gable end and two sets of stairs leading to the simple step seating. The viewing bays can be closed by the lowering of hinged timber panels which are otherwise secured horizontally by a catch system on the tie beam of the roof trusses. Timber side infill panels can also be removed for better viewing of the oval. 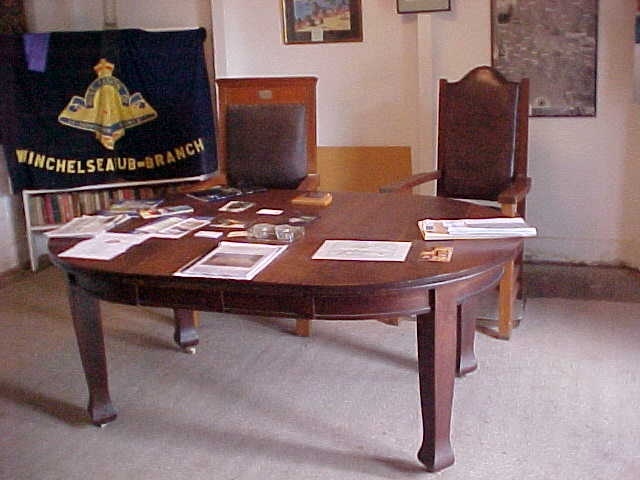 The building still contains the RSL clubrooms and now houses a collection of services memorabilia pertaining to the local community. It is also used for commemoration services and the viewing of sporting activities which continue to frequently take place on the oval. A former players' room at the western end of the building, with access to the oval, is now used as an umpires' room. 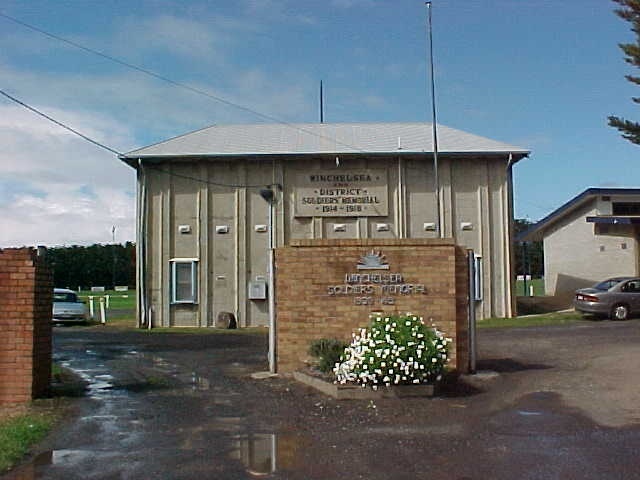 The memorial grandstand, Winchelsea is of architectural, historical and social significance to the State of Victoria. The memorial grandstand, Winchelsea is of architectural significance as an example of the use of the Knitlock system of construction. This system as a do-it-yourself means of building was not a great success, perhaps because it required greater skill than initially thought. As a result there are a limited number of extant examples of its use. 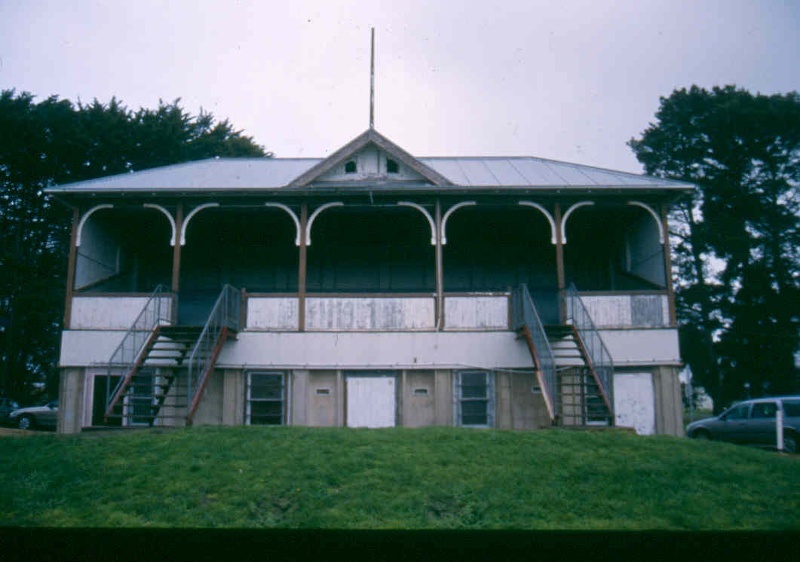 The grandstand is also a rare example of the system applied to a non-residential building, the only other recorded examples being the Towler Real Estate Agency, Edithvale (1925, since demolished) and the Oatlands Country Golf Clubhouse, Telopea, NSW. As such it appears to be a rare example of Knitlock construction applied to a public building in Australia. It is also unusual for it to be applied to a two storey structure and important due to its unpainted condition on the approach side, which clearly indicates the construction system adopted. The building also incorporates the unusual device of hinged timber panels, that can be lowered to secure the open grandstand, and removable side panels that provide enclosure to the otherwise open sides. It would appear that this is an unusual inclusion in a grandstand design and no other examples have been located. 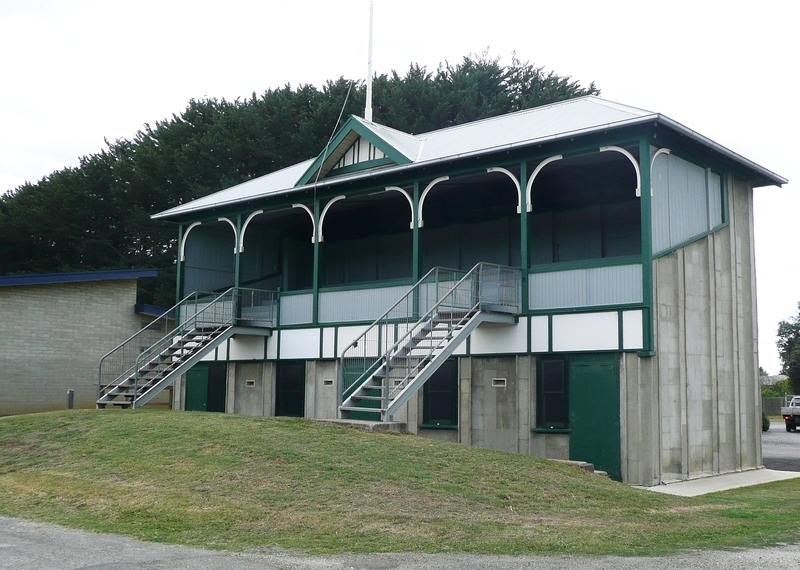 The memorial grandstand, Winchelsea is of historical and social significance due to its associations with World War One and the impact it had on the Australian community. It is a rare example of a war memorial erected as a functional public building. It was more common for World War One memorials to take various monumental forms than to be constructed as utilitarian buildings. If the latter was adopted, it was most commonly in the form of a memorial hall, and in a small number of cases a hospital or school. It is most unusual for a grandstand to be erected for this purpose, and only a small number have been identified. These include Allansford Memorial Pavilion (1922), Memorial Pavilion, Anzac Park, Warracknabeal (1923) and the Soldiers and Sailors Memorial Pavilion, Gardens Oval, Port Fairy (1923). These are all of typical timber construction. 1. All the building and structures marked as follows on Diagram 1525 held by the Executive Director. 2. All the land marked L1 on Diagram 1525 held by the Executive Director being part of the land described in Crown Allotment 1 and 2, Section 19, Township of Winchelsea. 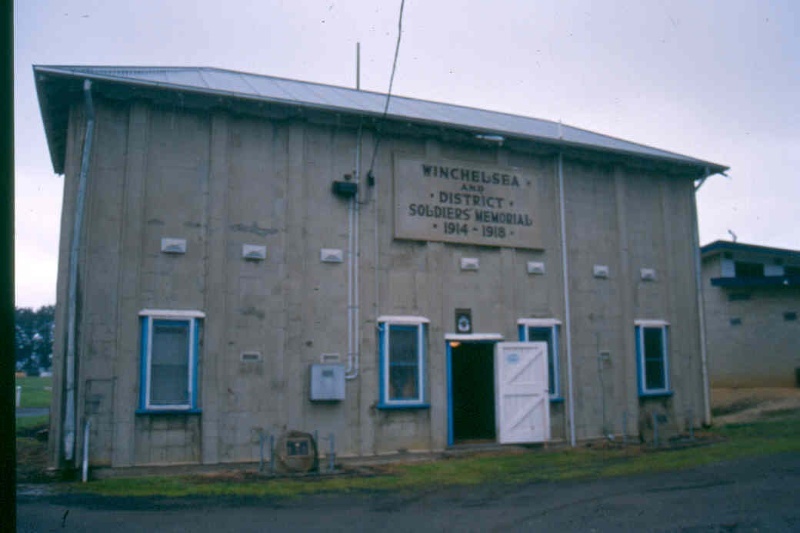 Despite the small population of Winchelsea, funds for a World War One memorial were raised by public donation, resulting in the erection of a substantial grandstand, incorporating the Winchelsea and District Branch of the R.S.L. clubrooms under the seating. It was built by voluntary labour at a cost of £775. A local business group was involved in its construction, using the Knitlock system, patented in Australia by Walter Burley Griffin in 1917 and described by him in Australian Home Builder in 1922. This system was developed as an economical and quick do-it-yourself construction system, with machine produced standard concrete tiles, or segments, which were fitted together on site. It appears that three local men were involved in the development of the Knitlock system of construction in Winchelsea; Mr Anderson (finance), H. E. Warner (builder) and A. McDonald, who established a Knitlock manufacturing works in a shed in Hesse Street, Winchelsea. Machines and timber moulds were used to cast the concrete tiles, which were basically of two type; the vertebral, quadrant shaped block, that formed the framework and the distinctive vertical piers, and the tesseral block that provided the wall infill. The former blocks formed columns and corners and the latter were interlocked back to back with staggered joints, resulting in smooth surfaces both externally and internally, and the facility to incorporate steel reinforcing rods in the core between blocks. Blocks were one foot square and vertical piers, with hollow cores, placed at four foot intervals. Timber moulds that were used in their manufacture have been retained, and are exhibited in the collection of RSL memorabilia at the building. A number of tiles have also been retrieved and are in the possession of the Winchelsea Historical Society. Walter Burley Griffin first used his patented system in 1919 and designed a number of houses using this construction technique both in Victoria and New South Wales. Other architects, such as Klingender and Alsop, also utilised this mode of construction and designed ‘Jura’ using Knitlock construction in Lorne in 1919. H. E. Warner was one of the few builders in the district and some of his work was in Lorne, however it has not been established whether he was the builder of this Knitlock house. The only other recorded use of Knitlock in Winchelsea is a house that is extant, however not accessible to the public, and a fence, which has been demolished. General Conditions: 1. All exempted alterations are to be planned and carried out in a manner which prevents damage to the fabric of the registered place or object. General Conditions: 2. Should it become apparent during further inspection or the carrying out of works that original or previously hidden or inaccessible details of the place or object are revealed which relate to the significance of the place or object, then the exemption covering such works shall cease and the Executive Director shall be notified as soon as possible. General Conditions: 3. If there is a conservation policy and plan approved by the Executive Director, all works shall be in accordance with it. Note: The existence of a Conservation Management Plan or a Heritage Action Plan endorsed by Heritage Victoria provides guidance for the management of the heritage values associated with the site. It may not be necessary to obtain a heritage permit for certain works specified in the management plan. General Conditions: 4. Nothing in this declaration prevents the Executive Director from amending or rescinding all or any of the permit exemptions. General Conditions: 5. Nothing in this declaration exempts owners or their agents from the responsibility to seek relevant planning or building permits from the responsible authorities where applicable. Minor Works : Note: Any Minor Works that in the opinion of the Executive Director will not adversely affect the heritage significance of the place may be exempt from the permit requirements of the Heritage Act. A person proposing to undertake minor works may submit a proposal to the Executive Director. If the Executive Director is satisfied that the proposed works will not adversely affect the heritage values of the site, the applicant may be exempted from the requirement to obtain a heritage permit. If an applicant is uncertain whether a heritage permit is required, it is recommended that the permits co-ordinator be contacted. Any works to non-registered buildings within the extent of registration. The cultural heritage significance of the Memorial Grandstand is principally due to its architectural use of the Knitlock system of construction. It also has historical significance as a functional World War One memorial. Externally the grandstand is highly intact with the exception of the reconstructed staircases. 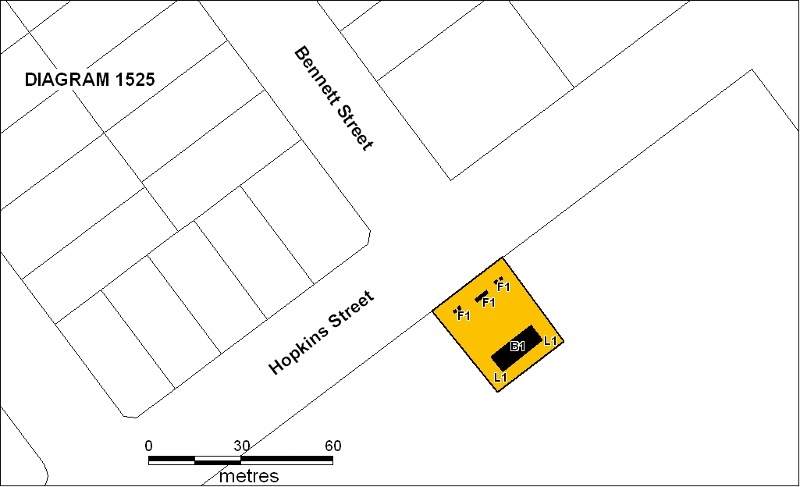 In particular the unpainted Hopkins Street facade importantly indicates the construction system adopted and this surface should not be painted or altered in any way, including the memorial name plaque. It is important that the unusual hinged screens and side screens are retained. Internally the Knitlock walls have been painted, however the construction system is still visible and this should be maintained. 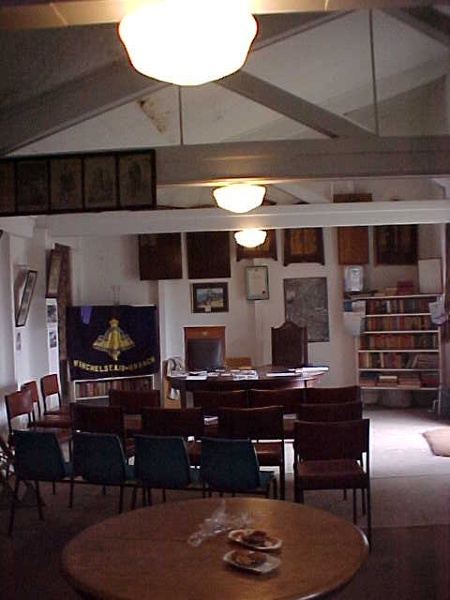 Pressed metal ceilings in the RSL clubroom should also be retained. Alterations which impact on the significance of the exterior and interior of this structure are subject to permit applications. The rebuilding of the staircases and the reconstruction of the section between the staircase landings and the top of the windows should be encouraged, if their original form and design can be established. (An undated photograph, reproduced on a plaque in front of the memorial gates and in the possession of the Winchelsea Historical Society, shows the position and design of the original staircases).